Aaron Dembski-Bowden is a British author with his beginnings in the videogame and RPG industries. 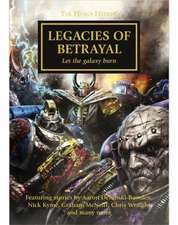 He's written several novels for the Black Library, including the Night Lords series, the Space Marine Battles book "Helsreach" and the "New York Times" bestselling "The First Heretic" for the Horus Heresy. He lives and works in Northern Ireland with his wife Katie, hiding from the world in the middle of nowhere. His hobbies generally revolve around reading anything within reach, and helping people spell his surname. De (autor) Graham McNeill et al. De (autor) Aaron Dembski-Bowden et al.